In the 80’s, Mark Sisson decided to step away from his career as an elite endurance athlete to focus on pursuing the healthiest possible lifestyle and teaching others how to do the same. This decision took him down a path of new habits that went against everything he had learned in his career, including trading carbs for healthy fats and endurance exercises for strength and fun movements, including paddleboarding. He discovered the closer he got to moving and eating like our hunter-gatherer ancestors, the healthier, stronger, and happier he felt. This realization pushed him to start his now uber-popular blog Mark’s Daily Apple and write his best-selling book The Primal Blueprint, which made him a leader in the Paleolithic diet community. In the last couple of years, Mark began experimenting with the ketogenic diet. To his surprise, going keto not only helped him burn more fat. He shed fat without losing any muscle mass, ate fewer calories, felt less hungry, and had more energy. Despite being 30 pounds heavier now, he still maintains the same level of body fat he had when he was a marathoner. Mark now uses ketosis as a powerful tool for leveling up his performance. 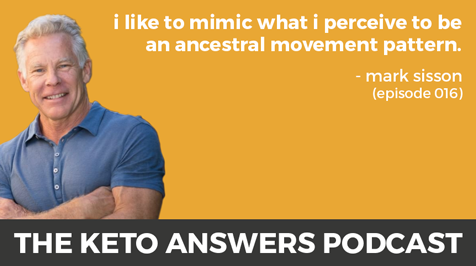 Today I have the pleasure to sit down with him to talk about movement, what it’s like to go from paleo to keto, food quality, metabolic flexibility, and harnessing the metabolic advantages of ketosis for better performance. Is it possible to eat less without getting hungry?